Snowshoe trekking is the ideal option for skiers and non skiers alike. On a flying visit ? Would you like to get a quick taste of "Swissness", fabulous scenery, walk through the pure white snow, something short, sweet and exciting ? Well, yup this snowshoe trek is for you! Free Transfers we will pick you up free of charge from your hotel/hostel in the Interlaken area, or from Interlaken Ost. This is defiintely the most scenic tour we offer. Enjoy a 360 degree panoramic view of the world famous swiss alps. Take time out and head for the mountains, away from the hectic crowds, away from the stress of mundaine living, to secret hideway conditions. 09.am Meet at SAG base in Interlaken - hand out equipment. 5pm Return to the hut, fire up the wood stove and dinner will be prepared. 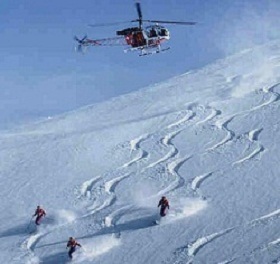 The guide will assess the snow conditions and choose the best tour for the day. You will be put to the test and what your have learnt about the mountains and snow structure will be questioned and simplified.